Susan Cain is one of the most respected authorities on introversion and she does not disappoint with this book. The is a great read for anyone who has ever wondered why they don’t necessarily “fit in” with the crowd, especially those of us who work in corporate America. If you are an introvert, this book will not only help you find acceptance within yourself but it will also help to validate and strengthen who you are as an individual. It provides excellent insight, backed by plenty of scientific research into the mind of an introvert. It also dispels many misguided beliefs and lists the absolute strengths of an introverted personality. The author provides quite an impressive list of achievements given to the world by introverts; achievements such as the theory of gravity, theory of relativity, Chopin’s nocturnes, and even Google. 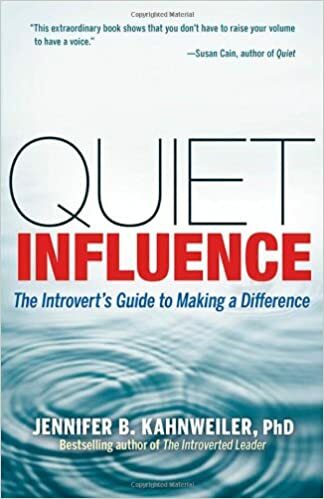 Whether you are a person coming to terms with your introverted nature, or someone seeking to understand an important introvert in your life, this book is a must read. While this book by Stephen Chbosky is not primarily geared toward the subject of introversion, the primary character, Charlie, brings the subject to life in a captivating way. Charlie is an introvert who has chosen to take a backseat approach to life. The story follows Charlie as he experiences his firsts life lessons, discovers repressed childhood memories, and tries to come to grips with the person he really is. Chbosky takes the reader through some seriously deep subjects such as eating disorders, abortion, drug use, and even suicide. Charlie takes the reader with him through his times of depression, isolation, struggle to make friends, and the many difficulties of teen adolescence. This book will provoke you to look at those around you in a completely different way and to approach life with a different perspective, accepting all of the ups, downs, and unexpected turns that life can throw at us. It seems that people either love this book or hate it. I loved it and I think most who consider themselves to be introverts will appreciate most of the views that Thoreau expresses in Walden. He complains of too much noise in the world and decides to go it alone, literally. He built (with his own hands) a cabin in the middle of the woods on Walden Pond in Massachusetts. He completely disconnected from society for more than two years and even ate from the land on which he lived. This book resonates with me because I have often had similar thoughts, especially when the hustle and bustle of daily life gets to be too much. Sometimes, it takes more than sitting alone in a Starbucks or the quiet confines of my bedroom to recharge. Walden agreed and decided to remove it all, or at least remove himself from the business of the world. If you should ever decide to spend some time alone, take this book with you and it will give you an indulgence like you have never experienced before. by Marti Olsen Laney Psy.D. This book explores the important areas of life that we all deal with. Issues such as parenting, marriage, work, and socializing as an introvert. Many people, introverts included, do not necessarily find the characteristics of introversion to be positive in the many aspects of daily life. The author does a great job of pointing out the advantages and offers a fresh perspective on the subject. The bottom line is that introverts ARE normal, unique, and add many interesting nuances to an otherwise extrovert-dominated world. If you are an “innie” and constantly push yourself toward extroversion, this book will definitely enlighten you and offer some overdue relief! My only regret is that I did not read this book years ago. She goes on to list several noteworthy influencers of current and past societies who were introverts including Abraham Lincoln, J.K. Rowling, Steven Spielberg, Warren Buffet, and Eleanor Roosevelt. Influence isn’t about being overbearing or controlling. Power and influence has much more to do with what is said, than how it is said. Can Introverts Be Effective Leaders? In a world full of fast-moving trends and constantly changing business landscapes, it is easy to get lost in the shuffle. This is especially true for those of us with an introverted personality and leadership style. Our extroverted counterparts are comfortable in the spotlight and we are more than happy to give it to them, but that certainly doesn’t mean that we are weak or inefficient leaders. In fact, introverts possess several qualities that can serve them extremely well in leadership roles and put them at the head of the pack. By nature, introverts prefer to listen much more than they speak. This can be an especially important quality in any leadership setting. The ability to open their ears and minds to the ideas and thoughtful suggestions of those that are closest to you is an amazing attribute of quality leadership. If you are looking for a quick answer to an important question, chances are you will not get it (or at least not the one you want) from an introvert. Predisposed to expressing themselves through writing rather than speech, they prefer to mull things over before offering feedback or advice. This is because introverts prefer to think through important decisions for hours, or even days before offering suggestions to solve a problem or chart a new direction. They will rarely fall victim to making a snap decision just for the sake of time or peer pressure. Large quantities of surface level relationships are not what the typical introvert is interested in. By nature, they are more interested in building deeper and more meaningful relationships, even if that means having less of them. External and internal relationships are the very basis of business success, and quality relationships are one thing that introverts are great at. These relationships give them credibility and trust, which can in turn offer leverage when it comes time to gain buy-in. They know when their mental tanks have been exhausted and know precisely when to seek time to recharge their batteries. Introverts often work exhaustively to accomplish tasks, but they typically will not push themselves to a point of mental or physical breakdown. This can help to alleviate the risk of burnout, which can cripple any organization if left unchecked. Not only do introverts work effectively alone, most of the time they prefer it. When you give a capable introvert enough space and blocks of uninterrupted time, there is no limit to what can be accomplished. This allows them to maintain a laser focus on the priorities of the day, and most importantly allows them to systematically and successfully navigate the organization around obstacles. This goes back to the whole spotlight thing from above. Not only are introverts willing to share the spotlight, they are often willing to give you the whole stage. This means that they often care more about the success of the organization as a whole, than about their own individual achievements. This bodes well for the organization and its’ employees because there is rarely a need to question the loyalty and intention of a humble leader. When it comes to getting things done, not only are they more than happy to pitch in and help accomplish the mission but they are less concerned about who gets the credit for the achievement. This isn’t to say that all extroverts are selfish or that all introverts are selfless, but by our very nature we are less likely to seek out applause or attention, especially in a public setting. In leadership roles, this same aspect extends to those who work with and for the introverted leader. I am certainly not naive enough to believe that every introvert is a great leader, just as every extrovert isn’t a poor one. I believe that there are too many preconceived notions regarding introverts and their ability to lead successfully. It isn’t everyday that you see the terms introvert and leader in the same sentence, but the list of successful introverts, who are or were also leaders is extensive. The list contains names such as Albert Einstein, Mahatma Ghandi, Bill Gates, Abraham Lincoln, Eleanor Roosevelt, and Warren Buffet. The qualities that these great leaders are known and remembered for are the same qualities that many people still respect and expect from their leaders at any level. Qualities such as cool-headedness in the face of adversity, prudent thinking, and exhibiting a sort of quiet power. These leaders, and thousands of others continue to prove each and everyday that effective leaders come in all shapes, sizes, and personalities.